This Vista Class A Motorhome exudes style and elegance yet remains an affordable option. With its LED interior lighting and vinyl flooring, this model looks fresh and modern on even the darkest of days. 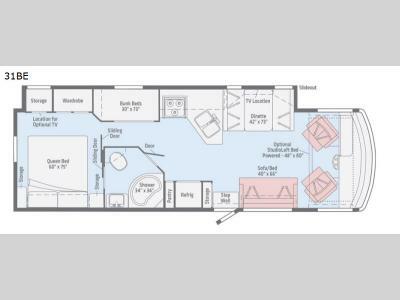 And because this unit houses a queen-size bed in the rear private bedroom and two bunk beds in the coach, it can sleep eight people during your many adventures. 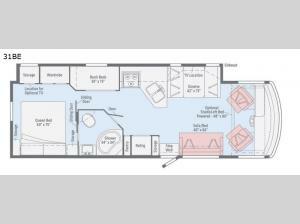 Even the storage availability on this motorhome is extensive with its 147 cubic foot exterior storage space, along with the kitchen pantry and bedroom closets. 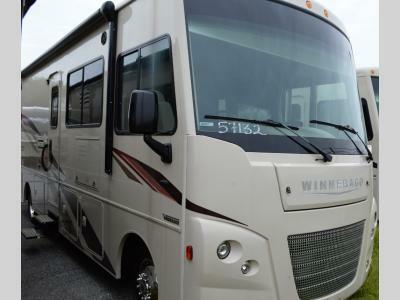 Winnebago has constructed this motorhome with the highest of standards, and you can see the quality firsthand when you take a look at the premium high-gloss sidewall skin as you step foot onto the automatic entry door steps and through the screen door. Once you set off on your excursion, you will enjoy exploring all of the comforts that the cab area provides, like the multi-adjustable Primera® cab seats with fixed lumbar support and the radio/rearview monitor system that includes a 6.2" LCD color touch screen. And after the sun has set and you have parked your vehicle, you can freely stretch your legs outside because the porch light and electric awning with LED lights give this motorhome a little extra space for you to enjoy nature.